February 09, 2008 by nina kuriloff in "Irving Penn", "Nina Kuriloff", "The Morgan Library and Museum"
Yesterday I had the good fortune to see a superior exhibition of 67 portraits by photographer, Irving Penn. This exhibition is on view at The Morgan Library & Museum until April 13, 2008.. The Morgan is located at 225 Madison Avenue at 36th Street in Manhattan. Penn is certainly a very gifted photographer. Almost every image in the exhibit is a compelling one. 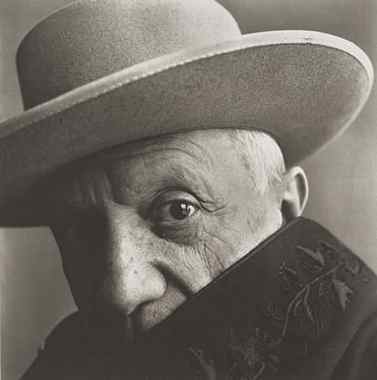 The portrait above is of Pablo Picasso in 1957, by Irving Penn. More information about this exhibition is located here. Among my favorite images in the exhibit are the portraits of Georgia O'Keeffe, Jasper Johns, Salvador Dali and Louise Bourgeois. "Irving Penn", "Nina Kuriloff", "The Morgan Library and Museum"